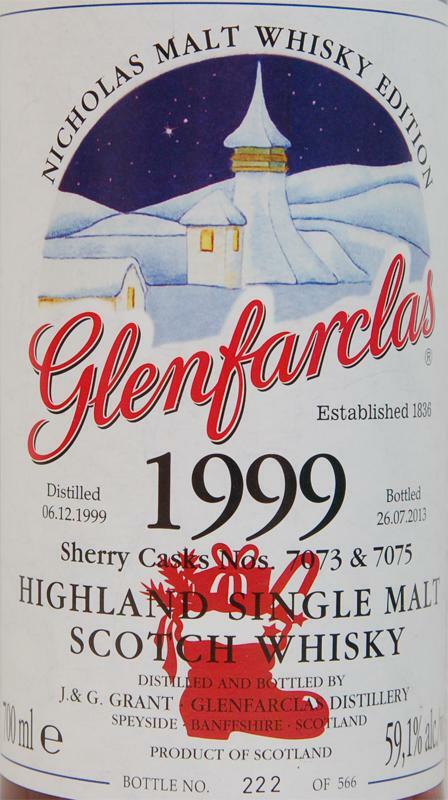 I really like the Glenfarclas. 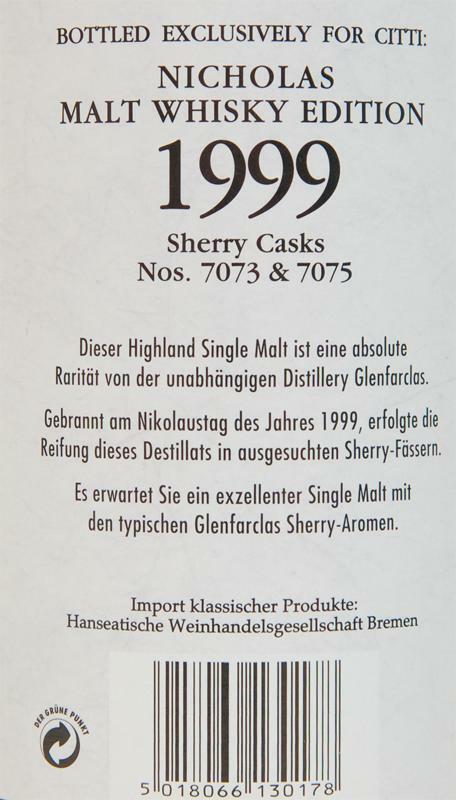 Diluted he brings the full creamy caramel-sherry chocolate spread, pleasant sweetness and beautiful oak. Unfortunately, the high alcohol content is only moderately involved. Sherry and slightly tingling alcohol, creamy caramel, toffee, plums, oak, subtle fresh herbs (cough drops), peach, raisins, milk chocolate, buttery, light sulfur tones, orange peel, for 13 years, he has already quite a "maturity" noticed, alone is disturbed by the alcohol content. again sweet creamy caramel, before plum cake with butter crumble with espresso and dark chocolate is served on an old oak table, carnation, clear sherry on the long finish with subtle Metholfrische in the end. Intense and dark berry flavor mixed immediately after pouring with sweet caramel and fine spicy oak. Tough, sticky oily streaks on the glass wall and run back into the glass in slow motion. The high alcohol content is noticeable relatively quickly and is slightly sprittig. After a while the hot alcoholic notes disappear and the caramel mixes with creamy butter. 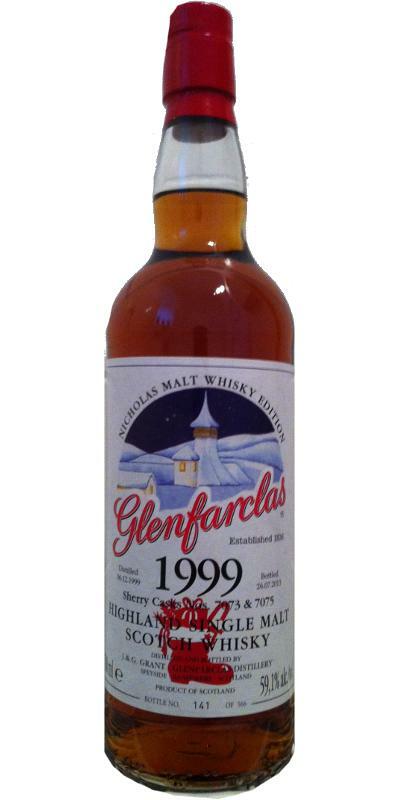 Intensely amber Glenfarclas shines in the glass while mixing dark orange flavors with dried raisins or dates. 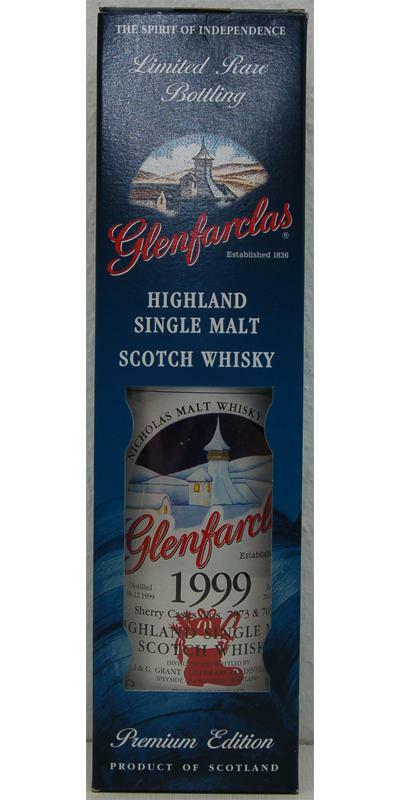 Strong malt penetrates the spicy oak tones, the orange aromas slowly recede and the malt and oak dominate. At the first sip, a pinch of cinnamon and chocolate appears before the spicy one beats mercilessly. Woody sharpness exudes an intense oak aroma, cinnamon comes from the slightly peppery sharpness. Creamy milk chocolate mixes with a slightly bitter espresso note, the heat still heats the palate and makes the tongue burn easily. Subtle sweetness and caramel come from the sharpness while slowly creating a bitter leafy and walnut aroma. The sharpness of the taste is still noticeable at the beginning of the finish, but it sounds so slow and leaves a strange spice mixture on the tongue. Decent harsh oak tones and immature walnut aroma mix and spray a fine tart and spicy aroma. Full of sherry and chocolate-caramel biscuits. A touch of Christmas smells (orange, nuts, cloves etc.). But it dominates the sherry and the oak. With water, the oak comes out even stronger. For me, a more mature Glenfarclas 105 in character.